WELCOME to my creative design studio and the home of Your Design I Q where you will gain design confidence, become inspired with design ideas and learn how to create your own personal sanctuary. Immediately, you will be able to take charge of your own decorating projects. If Do-It-Yourself (DIY) decorating is challenging for you without the guidance of a professional, knowledgeable and experienced interior designer, Your Design I Q is your answer! Interior design is no longer a secret when you understand which colors and furniture styles you really like and want to live with. The secret is out! Join the thousands who are using my fail proof method. Your Design I Q asks you precise questions to give you customized instant solutions. It is the easiest, quickest and most accurate tool used in the interior design industry today. I developed this one-of-a-kind, online Your Design I Q questionnaire for you to use whether you are decorating your home yourself or working with an interior designer. Either way you must have this information to make personal design choices for the home of your dreams. You'll discover your individual and unique, taste and style. You will be empowered to be your own interior designer! Your Design I Q will help you finally and forever identify your favorite colors and style for both decorating and fashion choices. Only live with what you love! Remember. rooms have no feelings, YOU do! Don't wait - just answer these necessary questions all designers ask their clients about color and materials before beginning any design project. Receive a 10 page customized plan - no two results are ever the same! Discover "YOUR STYLE" to beautifully combine your favorite materials! Gain design confidence and remove doubt to make the right buying decisions! Eliminate disappointment - Make decor choices that express YOU to make you happy! Trust yourself - you now have all the tools! Confidently know what to buy - no more regrets over wrong purchases! Stay within your budget - buy only what you need and like! Have FUN decorating without agonizing stress! Quick and easy decorating to make you happy! LOVE "living in" YOUR HOME! Learn to identify which pieces you really like in any magazine picture! Barbara shares her experience, thoughts and ideas to help you decorate for yourself. 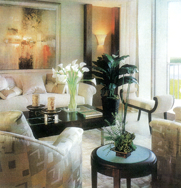 Learn interior design secrets, tips to help you be your own "interior" designer. Come back daily to see what's new. Walls-we take them for granted. They protect us, create cozy spaces, and serve as the skin of every room. After reading this article, return to this page for a new article!